I’ll often find myself at a location flooded with emotions as I take in the scene in preparation for an attempt at photographically capturing, at least partially, those emotions. 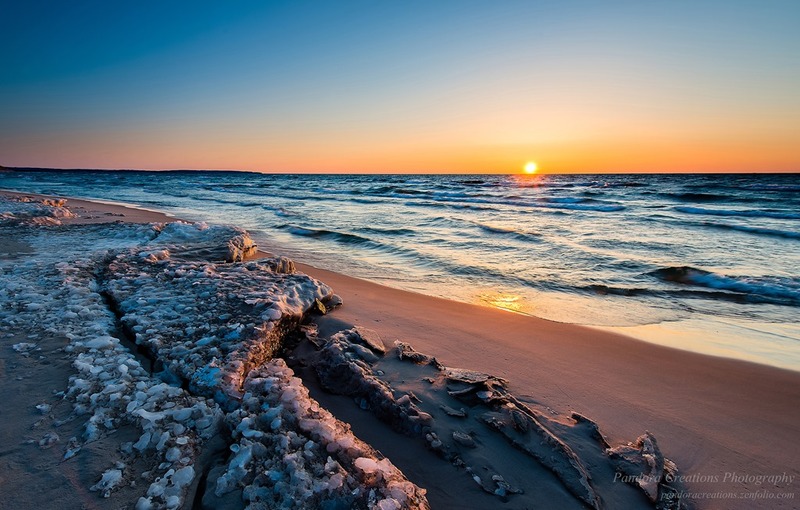 A recent trip to the beach in Empire, Michigan was no exception. The day was glorious–the sun was ablaze and the sky was abundant with beautiful clouds, puffy and plentiful, the kind you might see on a warm summer day. It was difficult to concentrate on the duties of my day job but I somehow managed, all the while making time for thoughts of a return to one of my favorite Lake Michigan locations, the Lake Michigan Beach Park at Empire. Long exposure, short exposure, low to the ground, eye level, near the creek, lighthouse in or out of the composition, my mind raced with the possibilities, but, remembering past sessions, I did my best to keep the thoughts in perspective–often it is the case that when we arrive at a scene, previous thoughts are rapidly replaced by an entirely new train of thought as we adapt to the reality that may be in direct conflict to our imaginations. And, as it turns out, this day at Empire was such a case. The sun was still ablaze, that had not changed, but not a cloud remained in the sky! It was as if the giant weather machine known as Lake Michigan had decided that no more clouds were necessary, and, as a result of this, my arrival was met with a bit of discouragement, but that quickly turned to optimism as I adapted to the conditions, accepted the challenge, and proceeded to go to work. I walked past the Robert H. Manning memorial lighthouse and when I reached the creek that flows into the big water from South Bar lake, north of the lighthouse, I turned around and made my way back a short distance. I took a few shots of some random ice chunks and sparse driftwood, but was not happy with the composition so I walked a bit farther until I came to a very interesting ice formation on the beach. 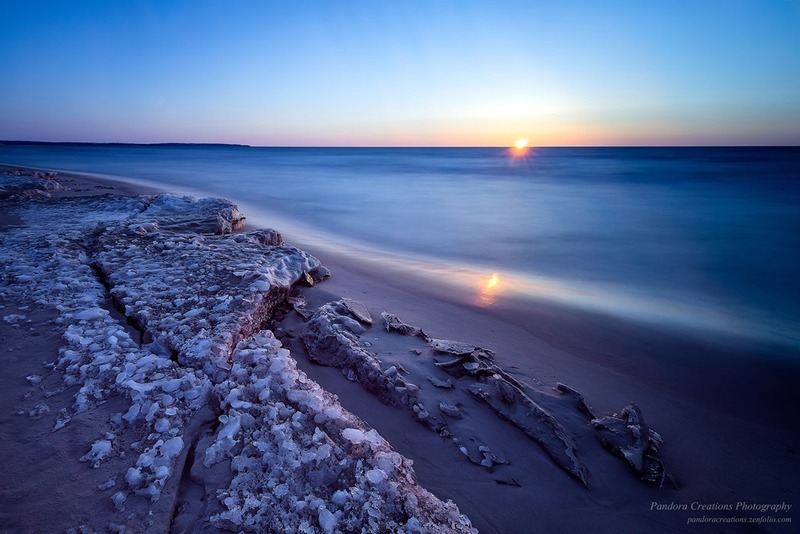 A mere remnant of the ice that dominated the shores not so long ago, it was clear that this particular chunk of ice was well on the way to disappearing forever and the scene captured my full attention beneath the rapidly setting sun. In my mind’s eye I saw two things here–one, the very real fact that winter had yet to release its grip made all the more apparent by the quite cold temperatures and, two, the very real fact that winter, try as it might, has a limited time each year to present us with its beauty, a shelf life, if you will. I decided to capture the first image with the grip of winter in mind. Cold, windy, with the sun rapidly approaching the horizon, I chose a long exposure in an attempt to convey what I was feeling as I stood near that ice formation. Tripod secure and filter in place, I triggered the remote and for fifty-eight seconds patiently waited, hoping that I had captured at least a fraction of the feelings flowing through my mind and body as I stood on the shores of Lake Michigan. The resulting image, Shelf Life, exceeded my expectations and I could not have been happier with the result. I chose to emphasize the blue tones of the scene as I felt those conveyed how I felt, physically, as the warmth of the sun was more a thought than a reality at this point in the season. I did not feel the warmth of the sun that day, but I most certainly heard the promise of that warmth before it vanished below the horizon.